Deeply set dynamics are involved in relationships this week, compulsions and obsessions that we may choose to ignore yet they are staring us in the face. Mars makes a station this week, just as Venus makes an opposition to Saturn and squares Pluto. Relationship developments are sure to be significant this week, as well as issues of anger, motivation, and being able to make things happen. Mars has been slowly moving backwards (retrograding) through the sidereal sign of its debilitation, Cancer for a while now. Mars prefers the direct approach and not watery Cancer’s murky omni-directional style. Cancer wants to hold and uphold the object of its attentions, Mars prefers to tame, dominate, and conquer; they just don’t mix very well. At any rate the planetary effect of Mars in Cancer is to irrationally inflame the emotions, and overly emphasize a sense of righteous indignation. Like I always say, a calm doer always out-accomplishes a blustering crusader in the long run. Cancer is also connected with a sense of national identity, literally with the soil that you sprung from, the ground that you call home. There has been a rash of ‘indignant out-lashes” against society: the suicide plane bomber in Austin, Texas; the recent shootings at the Pentagon, even the new and improved tea parties with militant mother figures in the spotlight (Sarah Palin). There have been nation-wide student protest against higher fees and cutbacks in university education. Cancer is also the sign of the Mother, that nurturing, enfolding, and caring universal force; quite opposite from its austere Capricornian counterpart, literally opposite it in the zodiac. The current transit of Mars through sidereal Cancer however (through May 23, 2010) is going to bring out the more radical and incendiary aspects of the sign though. 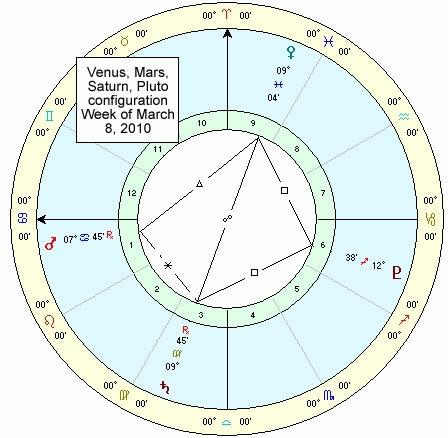 There is an interesting configuration of Venus, Saturn, and Pluto this week. Venus squaring Pluto brings out the more unbridled and unconscious aspects of love, while Venus and Saturn bring out also the more restrained and repressed aspects of human love. It’s like trying to cap a volcano, very difficult and not always successful. This is reinforced by the station of Mars in Cancer as well. 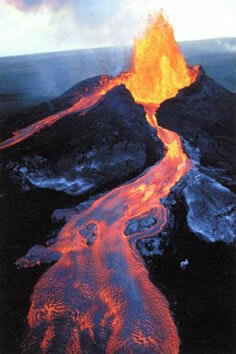 In fact man has yet to cap a volcano successfully; I guess it hasn’t even been attempted! The forces of Nature are not meant to be suppressed, the pressure builds up and eruptions, earthquakes, and tidal waves occur. We’ve certainly seen a lot of those lately, which I hope to comment on more fully soon. 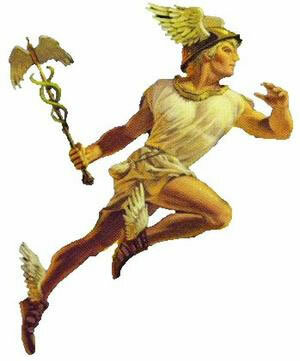 However the urges of Nature do need to be subdued, not by suppression, but by sublimation, transmutation, and alchemy. There are some spiritual circles that advocate the liberation of sexuality, and they have some legitimate points in my opinion. I think eventually though we need to recognize that we are more than just another species of animal replenishing the herd. Corporality is not our origin, contrary to what we are led to believe. We descended first as literal manifestations of God, spirits not limited to the laws of mortality. We took on gradually took on mortality, accepting the self-imposed karmic restraints that cosmic law exacts on those who misuse energy; thus aging, disease, and misery became our inheritance. People who live in monasteries or seclusion in my mind are actually trying to take back their control over the forces of bodily corporality, moving to another plane where the weights of desire bar their entry. The plane of mortality requires a body that is suited to it; the plane of immortality requires a different sort of body, the etheric body which is more akin to our fiery spiritual beginnings. It’s not my purpose to advocate any sort of life style in this article, but I am attempting to put into perspective some of the issues behind the astrology of this week. At any rate, things look to be pretty “hot” mainly on Tuesday, Wednesday, and Thursday, March 10, 11, and 12, 2010. Day by day readings, with updated results through the week eblow.